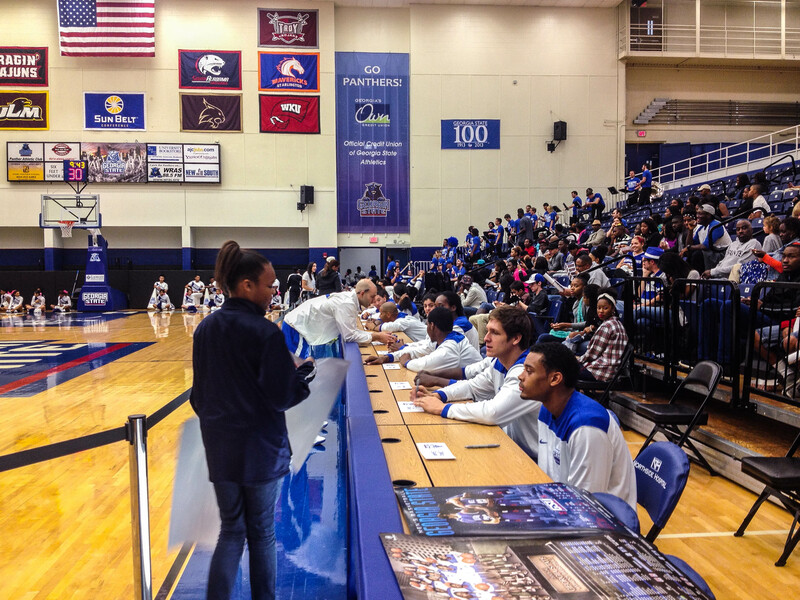 Men and women basketball players autograph posters for fans on Hoop Day at the Sports Arena last Saturday. With the bulk of the semester having football, soccer, tennis, golf, cross country and volleyball competing already, the men’s and women’s basketball teams finally made their first appearance this semester on Saturday. “I think it was a good start for us to bring fans to this basketball event before we get started on October 28th,” said Ike Fuller, senior associate of athletic director external affairs. The men’s and women’s basketball teams were the lone sports to have an athletic event on campus on Saturday. The weather in Atlanta was reported to be light rain with a high of 64 degrees and low of 54, but that didn’t stop 384 Panther fans from showing support for the teams. The event started at 1 p.m. with an autograph session for all the fans on the floor of the Sports Arena. Following the autograph session was player introductions for both teams and a skills challenge, including a slam dunk contest, which included select fans as judges, all for 45 minutes. The participants of the slam dunk contest were chosen between the players and coaches. CAA Rookie of the Year last year, sophomore guard RJ Hunter wasn’t chosen as one of the participants. Hunter insinuated that if he was in the dunk contest that his performance wouldn’t be as high-flying and acrobatic as the participants’. Sophomore forward LaRon Smith, freshman guard Isaiah Dennis and sophomore forward TJ Shipes were chosen to participate in the event. The highlight of the event is the now-viral dunk by 5’11” Dennis over 6’9” redshirt junior forward Curtis Washington. The dunk was listed as No. 5 on the Top 10 Plays of the Day early Sunday morning on ESPN’s SportsCenter. Despite the dunk, Dennis was not declared winner as the judges’ vote was a three-way tie. However, Hunter agreed with the judges’ questionable call. Hunter was not surprised with Snipes’ stellar performance in the dunk contest. Coach Hunter said that in his 27 years of coaching division one basketball he has seen all types of dunk contests, and this is the best one he has ever seen. He added that he was surprised about TJ’s performance, which made it hard for him to pick between the three on who should have won the dunk contest, and Snipes went to battle with those guys. After the dunk contest finished, two separate 30-minute scrimmages between the men’s and women’s basketball teams closed the event. “We hope that the interaction, engagement for fans through the players, as well the coaches, good thing, be able to bridge a connection between both parties,” Fuller said.